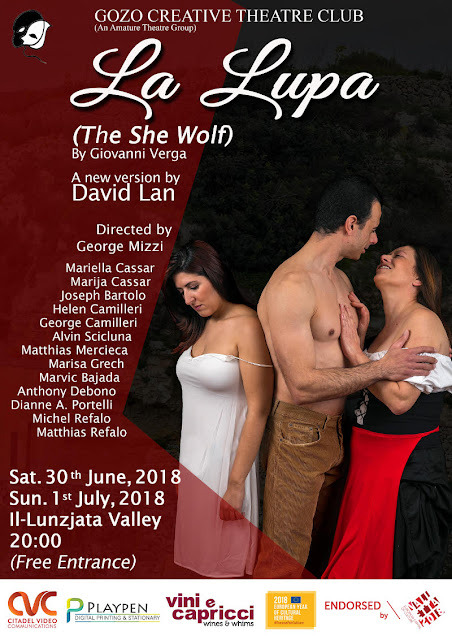 Giovanni Verga’s masterpiece, “La Lupa”, is set to come to life in a production staged by the Gozo Creative Theatre Club, based on David Lan’s “The She-Wolf”, an English-language adaptation for the Royal Shakespeare Company. This compelling drama of love and loss starts with jovial dancing and singing which slowly builds up tension by gradually developing into a battle of wills for the three main characters: Nanni, Pina and Mara, fighting their Christian beliefs along with their temptations, culminating in a decisive ending. Nanni, a man who is bewitched with Pina, also desires her daughter Mara, thus consuming himself and those close to him. Mara does not want Nanni at first however grows to love him resulting in her disowning her mother thus escalating her mother’s decent into madness. The cast features Mariella Cassar, Marija Cassar, Joseph Bartolo, George Camilleri, Helen Camilleri, Alvin Scicluna, Matthias Mercieca, Marisa Grech, Marvic Bajada, Anthony Debono, Dianne A. Portelli, Michel Refalo and Matthias Refalo, with local dancers and musicians also taking part. This production will be directed by the Gozo Creative Theatre Club’s artistic director George Mizzi. This production, endorsed by Valletta 2018 Foundation, will be held in collaboration with the Gozo College Education Department and the Ambassador & Permanent Delegate of Malta to UNESCO. The setting for this performance is the remote, rustic and magnificent location of Lunzjata Valley in Victoria, Gozo on Saturday 30th June 2018 and Sunday 1st July 2018 at 8pm. This is the first time that a play will be held in this beautiful location. Entrance is free. The seating will be on a first come first served basis. In collaboration with the Sacred Heart Seminary of Gozo, the Gozo Creative Theatre Club is proud to present the contemporary play ‘Il-Ħmar t’Alla’ by Joseph W. Psaila. This performance will conclude the events which mark the 150th Anniversary of the Seminary’s inaugration. This play is inspired by the life of the Curé d’Ars, John Maria Vianney, patron saint of parish priests. It portrays the struggle, on a spiritual level, between the hero and the anti-hero which can still rouse our conscience even today. The cast features George Camilleri, Jamie Camilleri, Joseph Bartolo, Helen Camilleri, Anthony Debono, Alvin Scicluna, Matthias Mercieca, Dianne. A. Portelli, Mariella Cassar, Maria Cassar, Marisa Grech, Marvic Bajada, Francesca Petra Mizzi, Joseph Portelli, Jerome Mizzi, Ruth Portelli, Michel Refalo, Joellson Bezzina and Matthias Refalo. This production will be directed by the Gozo Creative Theatre Club’s artistic director George Mizzi. This performance will be staged at the Sacred Heart Major Seminary Hall in Victoria, Gozo on Friday 17th November 2017 at 7.30pm, Sunday 19th November 2017 at 3.00pm and on Saturday 25th November 2017 at 7.30pm. Tickets are €5.00 each for adults and €3.00 each for children. For bookings please contact the Sacred Heart Major Seminary reception either through telephone: 21556479 or e-mail majorseminary@gozodiocese.org. Tickets will also be available at the door but seating is limited and will be on a first come first served basis. 𝐑𝐀𝐈𝐌 | Rich Arabs In Malta™ welcomes you to a magical mix of Arabic One Thousand and One Nights' atmosphere and a Latino Fiesta. 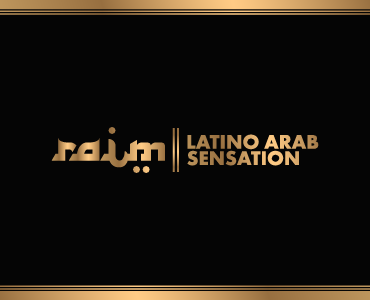 For one night only, we are mixing Algerian and Moroccan RAÏ and blending Latino rhythms to create a unique flavor and experience. For the first time in Malta, Y Events proudly presents two concerts by the world’s number one Elvis tribute artist and his band. 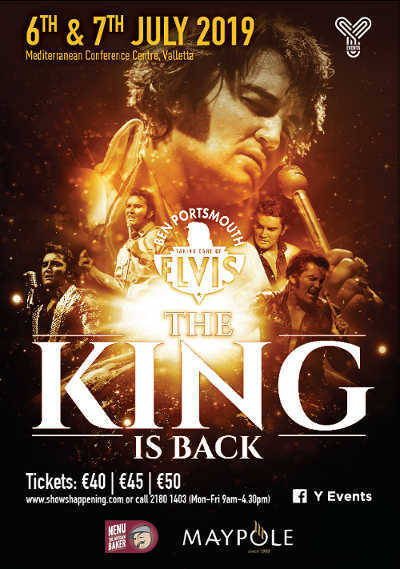 Elvis fans are in for a treat and an unforgettable trip down memory lane. Even Elvis’s most die-hard of fans will have a hard time believing that Ben is not Elvis himself. Ben, a multi-talented musician, singer and songwriter had Elvis’s DNA in his blood from an early age. His father was an avid Elvis fan and Ben grew up on a diet of Elvis songs. Having honed his musical talent Ben started his journey as an Elvis Tribute Artist in 2005 when he formed the “Taking care of Elvis” band. Audiences quickly realised that this was someone with a special talent. All factors lead to a common ground, giving us a clear indication that the village in which our story unfolds is located in Malta. The locality where the village feast is a predominant event in the yearly calendar. Where the Band Clubs, have a leading role in the heart of the society. Where individuals give their utmost to prove that their party is the best and cannot be beaten. Where the good spiritual shepherd is an icon. 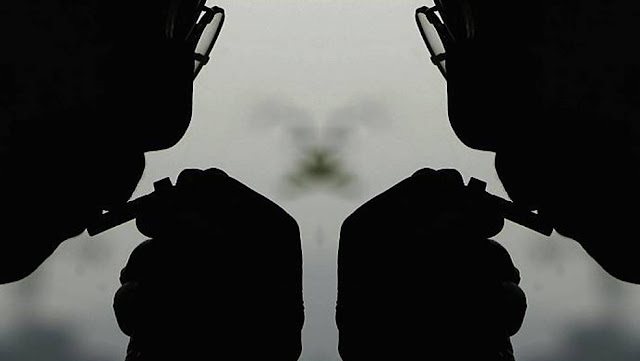 Every criteria matches a typical Maltese character; the same Maltese people that considered Paul of Tarsus an accursed man as soon as a viper bit him, but immediately changed their mind and made him a god-like figure. We always tend to kidnap comedians when we see someone worth the Stage. Did I say kidnap? I mean we ask nicely. We strongly believe that you guys deserve the best stand up performers and since we are out of cash lately, we find our own ways how to force them to come on stage. Did I say force? I mean they simply do not have a choice. 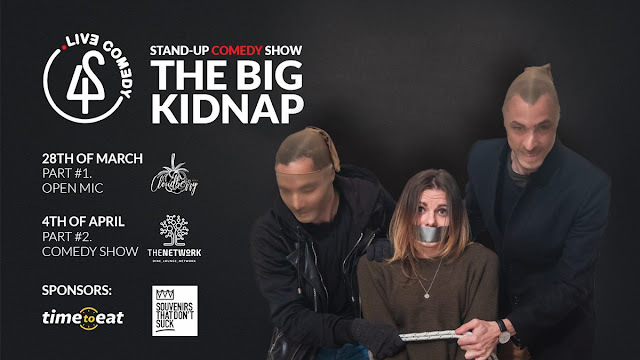 Right, so if you have not seen your friend in a while, we highly suggest you to check at The Network - gastro bar on the 4th April at the Big Kidnap Comedy show as he might be one of those that will come out of the basement and this time, without a bag on his head! P.s Keep it as a secret, but DJ WeToldUs is one of the unlucky ones that will be tied to his DJ controller for the whole night! Again, it is not that he has a choice! After last years massive success at Popeye Village it was inevitable that Rodriguez Jr. would return to our sunny shores. The venue chosen for this special night is located on the southern coast of Malta over looking our sister rock Filfla. 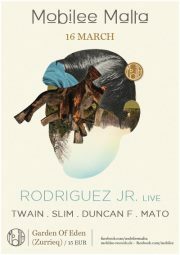 Also performing on the night will be the Mobilee Malta residents Slim, Duncan F, Mato and Twain. The event will be powered by no other than Funktion-One. Tickets are now out at 15 euros. Interested runners please contact 79887575, 79424701 or 79884787.